Last weekend I was in New York for my brothers bachelor party. We went to the Catskills and stayed at a house on 300 acres in the woods. That’s the grounds in the picture above. 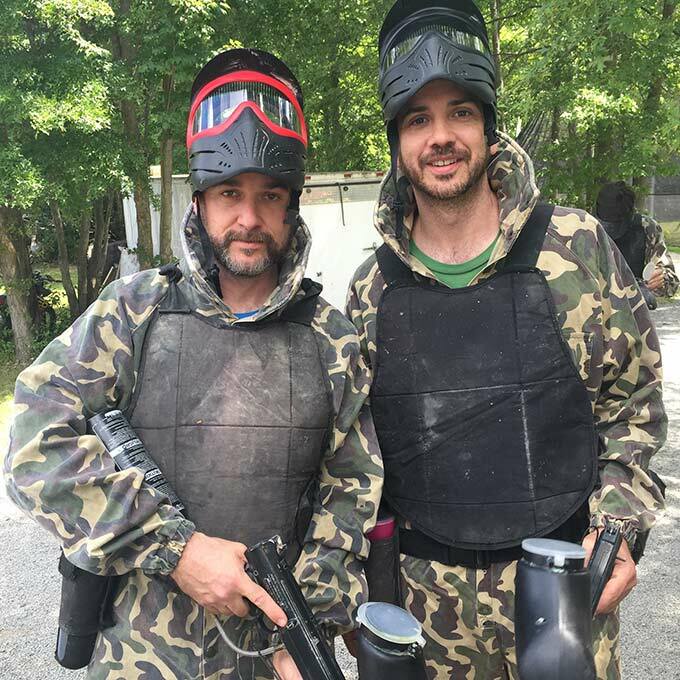 We shot eachother with paintballs and had a great time. 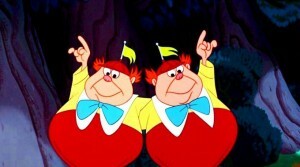 This is my brother and I. He is doing the serious face. For a change I had some time on an airplane by myself. I’m usually opening Play-Doh or Goldfish to try and keep my kids entertained. This was a welcomed change. With that time, I was able to listen to some podcasts that I downloaded before jumping on the plane. One in particular was really interesting. I was listening to a guest that Amy Porterfield had on her show. I can’t recall the guests name but she was talking about Slide Share. For those of you who haven’t heard of Slide Share, let me break it down. They are owned by LinkedIn. They provide a platform for people to upload presentations and share them online. Seems straightforward but here is where it gets good. That’s correct. 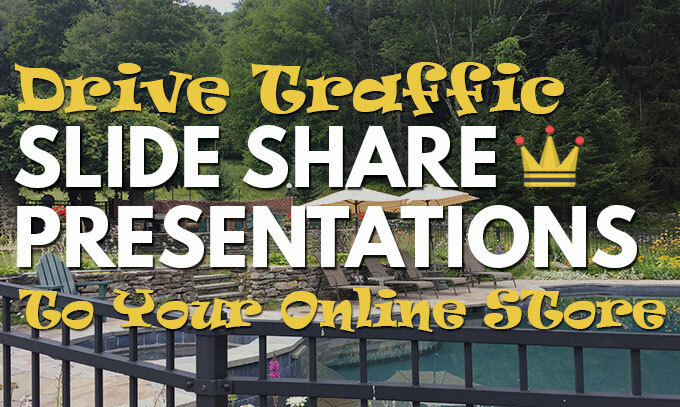 Slide Share gets over 70,000.000 visitors a month. Better yet, 70% of them come from targeted search traffic. Those are real numbers and something you shouldn’t be ignoring. People, clearly, are using Slide Share to attract traffic to their sites. This can be traffic for an online store or any website for that matter. In my initial quest to create backlinks for my wifes site I had used Slide Share. I had made a basic 2 slide presentation with links to her site and uploaded it. The problem was that I had done it just for the backlinks. I hadn’t considered the potential to drive traffic with this technique. The guest on the podcast explained how she had one presentation that was killing it. She mentioned it was responsible for driving more traffic than any source other than Google. I decided I needed to jump on the Slide Share train. I was going to make a valuable presentation and start driving some traffic to my wifes online store. Rather than reinventing the wheel, I decided to re-purpose a blog post of hers. The particular post was doing incredibly well. 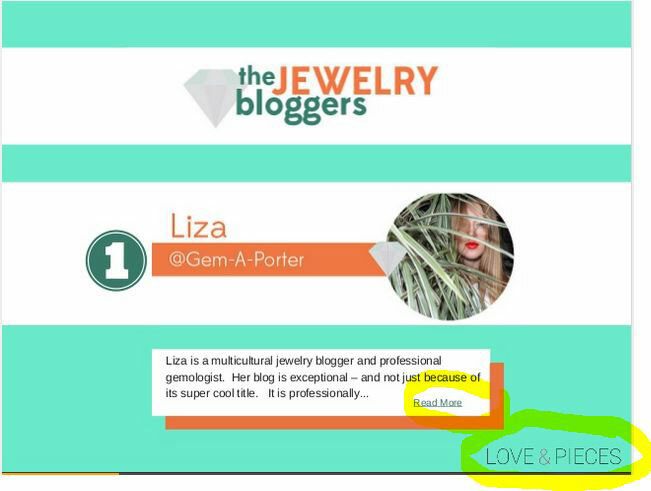 She created a list of 12 top jewelry bloggers to follow. It was shared socially and continues to drive traffic to her online store. I figured I could convert this blog post to a presentation and reach a new audience on Slide Share. Here is what I did. 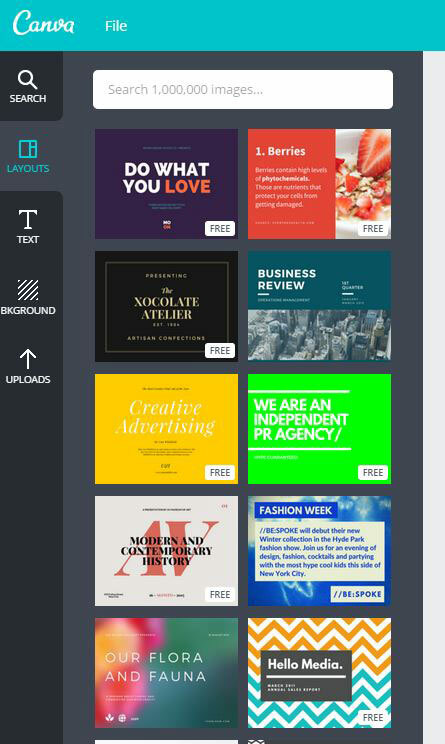 We talk about Canva in our post on free graphics sites and I have really grown to love this program. 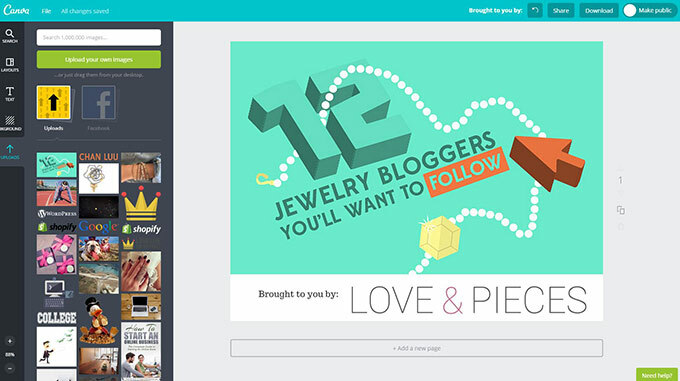 In one line Canva helps you make attractive graphics for free online. It has limitations, but for Free, who am I to complain. 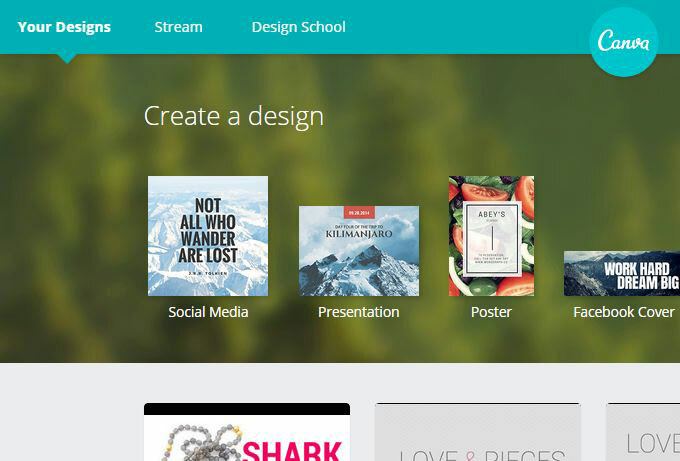 You first step is to go to Canva and create an account if you don’t already have one. Once you have created an account you are going to chose from their templates. You are looking for the “Presentation” template. Once you click this, you will see a beautiful list of templates they have already designed for you. You don’t have to be creative. They have done most of the heavy lifting here including imagery and layouts. In my case, I decided that I was going to use a blank one. The blog post already had a lot of beautiful images that were made by our graphic designer. My wife pays a marginal fee for each blog post to have the graphics professionally done. We talk about this in detail in our online store starter kit and I mentioned it in my post about outsourcing your blogging. 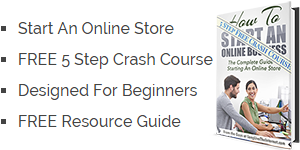 If you are interested in getting our “FREE 5 step crash course to starting your online store,” pop your email in below. You won’t be dissapointed. So in my case I was just going to re-purpose the images I already had. I started laying the images into the template and arranging them how I wanted. 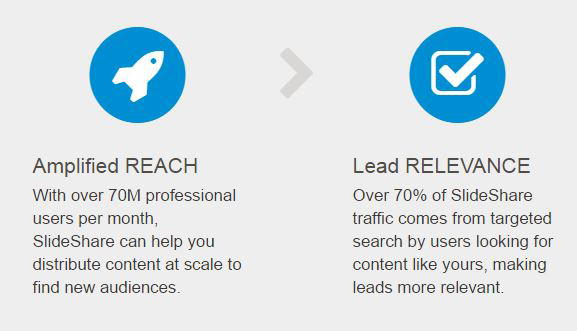 Make sure you add portions to drive people to your site. Don’t worry about the links now, but make note of where you are going to do so. I placed a logo in the bottom corner of every slide and also had a “read more” call to action after each blurb. HINT: I wouldn’t recommend putting linkable things in the bottom left or right corners. Slide Share uses this area to allow the user to navigate through the slides and it covers up some of your link. Lastly, I would make sure you have links to all your social networks and your site on the last page of the slide. If someone actually makes it through to the end, give them a call to action. Once you are done beautifying your presentation, you want to export to a pdf file. This will save the file to your computer. This pdf is almost ready but this is the crucial step. We still need to add the actual links in the presentation. This helps drive people to your online store. 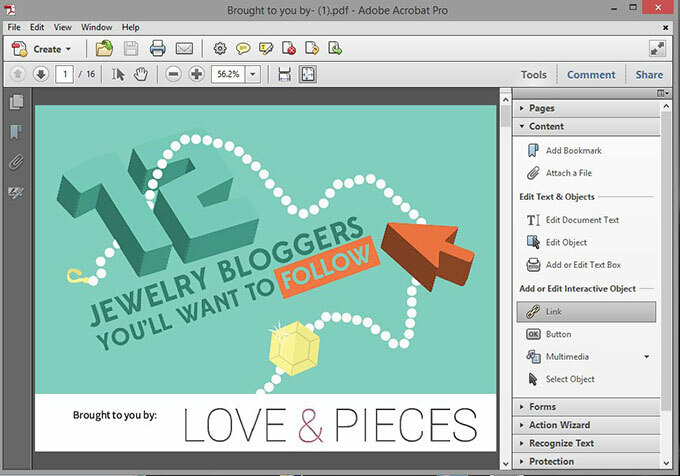 You are going to need Acrobat Pro to add links to your pdf file. If you don’t have this software (it’s expensive), you can download a free trial to do this step for free here. You will navigate to particular portions of the pdf document and draw a rectangle. 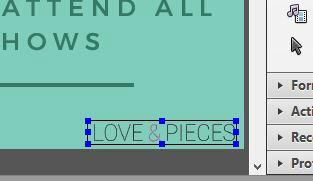 You want to make the rectangle large and around each of the areas you want to be clickable. Once you have drawn the box, a window will open to set the preferences. You want to make sure you make the link type an invisible rectangle. This prevents the link from showing and ugly box around it on the document. 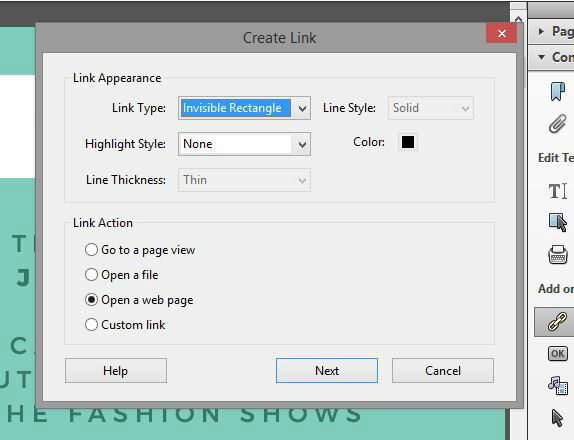 Next you will want to select “Open a web page” from the link action. You will click next and then you will be asked for the actual url that you want people to land on when the click on the link. Feel free to mix it up and send people to different pages based on the content they are reading. Once you have placed all your links you will save the pdf file. 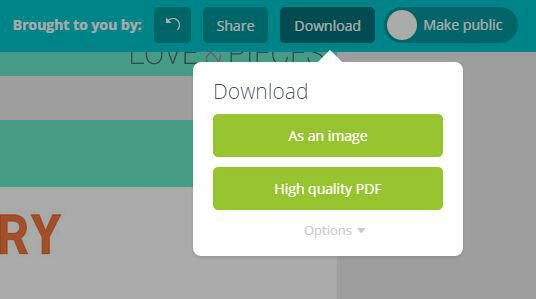 Now that you have your completed presentation with links, its time to upload it to Slide Share. 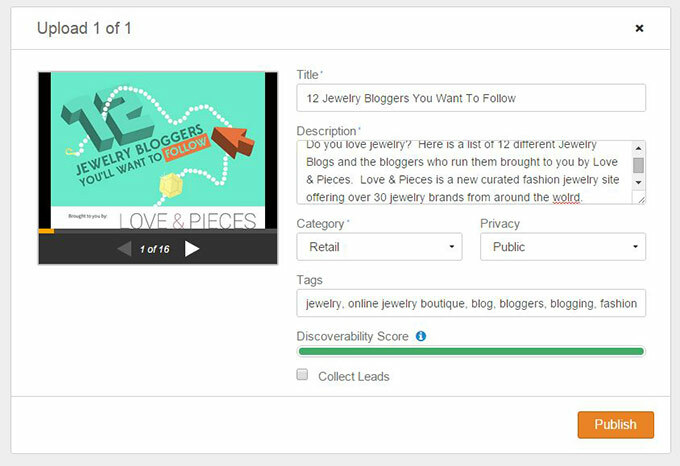 Create your free account and click on the button to upload at the top right of the screen. You will be prompted with the following screen. Now you want to select the pdf file from your computer or drag it onto this window to upload the pdf. 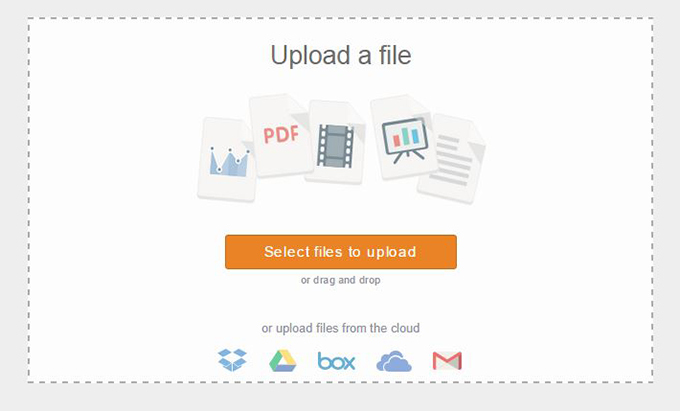 Once you upload the file, it will begin to convert it to a Slide Share presentation. Go through the following fields and make sure you give a title and description. You want these to be relevant to the search terms you would like to show up for. This information is indexed in both the Slide Share search as well as Google. Don’t skimp on this part. Make sure to fill it all out as thoroughly as possible. Once you are done you will click on the Publish button. You will be able to view the presentation in your account right away. Navigate through the presentation and make sure that your clicking portions are working properly. Your last step is to help give this presentation a little boost. I made sure to share it on my wifes Google + and Tumblr accounts. Most of her audience are not on these platforms but she had already shared the post as blog. She didn’t want to be redundant with the content to them but I wanted it to at least get indexed. These links back to the presentation will help build awareness for the piece from the search engines. While its way too soon to assess the success of this, it looks like we are off to a good start. in less than 24 hours its been viewed 19 times and is already showing on the second page of Google for certain search terms. 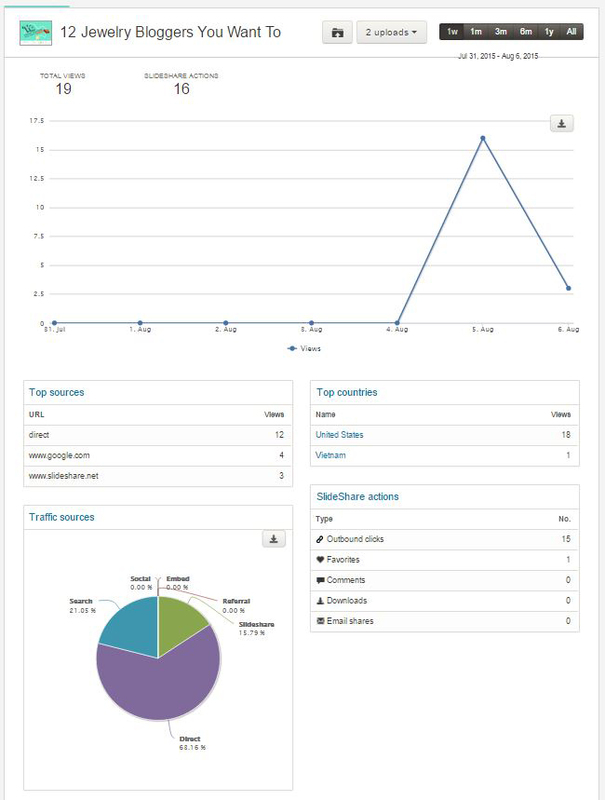 Better than that, it’s had 15 outbound clicks which are all to my wifes site. I would say we are off to a good start. These are not earth shattering numbers clearly, but its been 10 hours. For now I will let this sit and age like fine wine. It hopefully will continue to build traffic and leads to the site. When you are building an online store and increasing traffic to your site, there is no magic pill. Small achievements and small investments build over time. Each extra channel and technique adds up. Cumulatively it becomes a lot of traffic. Remember its a numbers game. You are looking to get as many people through your store to drive sales and increase your bottom line. Interested in the Slide Share I created? Here you go..